Rise Resort Residences: Often Dreams about Your Villa? Stop! Yes, Stop! If you’re often dreaming about walking down the stairs stopping by the grand king size bedroom, reaching towards the front side of your villa and glancing at the lively pool and some steps closer to the golf course, you must stop as it’s time to make your dream utter reality. Rise Group is lead by Mr. Vaibhav Jain, who has been setting the goal high of our expectations by launching and delivering so many high-end projects. Rise Resort Residences is a luxurious residential project comprises 7 types of villas of distinct sizes and amazing features. The project is located in Techzone 4, Greater Noida West where you can live your own dream on your own terms. This project is consists of some remarkable amenities, which will play the role of icing of the cake of for your grand villa, for instance, mountains, valleys, artificial spring water, wooden interior, buggy path outside villas, personalized golf cart, therapist, forest walk, jogging track, private lift, half a dozen swimming pools, and much more. 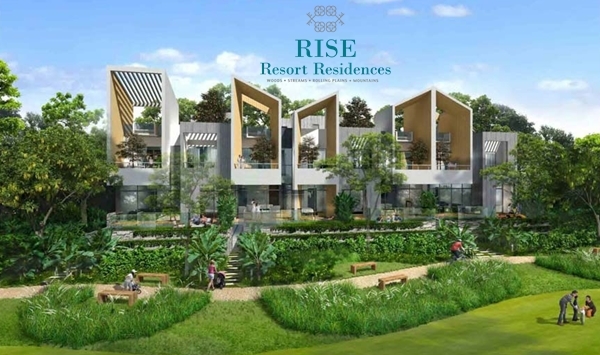 Rise Resort Residences Greater Noida is perfectly blended with luxury, splendor, and comfort to deliver the most happening home with advanced traits and elements. The location of Rise Resort Residences is excelling in the connectivity as it consists of so many location advantages, for instance, an upcoming medical college, an upcoming metro station at a distance of 1 KM, 20 minutes from Kalindi Kunj, Noida city center metro station, 10 minutes drive from the hospital, 5 minute drive from Sai temple, and the site is very well connected to Noida as it is at 0 Km of distance. The possession of the mesmerizing luxurious villa is soon. Hurry up and book your own villa now!! !